Since its introduction in 1932, The Fairy has become one of the world's most popular rose. This easy to grow little polyantha maintains a compact growing habit, rarely exceeding 3 feet in height with an equal spread. The charming clusters of pink blooms endure throughout the growing season and slowly fade to pale pink or white. The Fairy will continue to bloom up until frost. These characteristics make The Fairy a rose to use in a variety of situations - in the front of a border, as a low hedge along a walkway, or even in large containers. 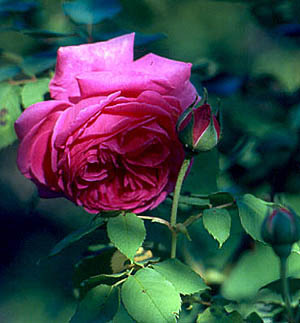 The rose will even tolerate a lot of shade but disease resistance will not be as good and growth will be more leggier. To keep the rose looking neat, shear it early in the spring and after blossoms fade and cut out dead growth. 'Climbing Fairy' is a very vigorous climbing sport. 'Lovely Fairy', a darker sport, was introduced in 1990.